I recently finished reading the management business book, Primal Leadership. 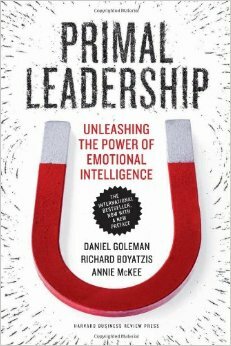 I have followed the authors, Daniel Goleman, Richard Boyatzis, and Annie McKee for years connecting to their work on Emotional Intelligence. I enjoyed this book on several levels and do recommend it. Their leadership model is research-based and accessible. The six leadership styles they present are fully explained through practical application. As someone focused on workplace learning and performance, the deep dive into how we learn is a welcome focus of the book. Simply put, “practice” is critical to our ability to learn, adapt, and be something new. I choose not to list out the leadership styles detailed in the book as I could not do them justice in this small space. Again, a strong recommendation to explore the book yourself. This is a good resource for someone focused on their own development as a leader and how to best bring leadership learning into an organization. What I do want to focus on though is the concept of Resonance. The book uses resonance to distinguish between strong effective leaders and damaging leaders. A resonant leader moves people in a positive emotional direction with a focus on establishing that “synchronous vibration” that leads to performance. Moreover, resonance leads to a lasting impact. The vibration resounds and continues … prolonging the positive emotional pitch. A focus on resonance should include equal time for dissonance and the discordant leader. This balance paints a full picture and adds clarity to the right path forward. Indeed our workplaces are home to many leaders with no sense or need of synchronous vibration. The cords they play are harsh sounding with no reverb. Those who know me, know that I can speak of dissonance and the discordant leader. Often the best teacher is one who gets results, but at what cost. One who starts over each time because there is no lingering vibration. One who stands as an example of what not to be. I had such a teacher and will always remember the learning and the choice to counter dissonance through resonance.